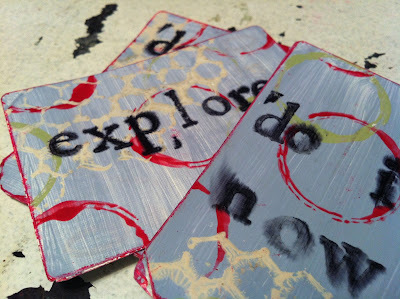 I'm participating in Jessica Brogan's Inspiration Deck Swap again! I must tell you that creating a whole deck of cards like this is so satisfying and fun. I am even considering registering TWICE and making a SECOND deck to swap! I love how the ink reacted with the spray fixative that I used! and then stamped each with a compass in a more haphazard, offset manner. I will add my contact info to this side. I hope so too, Katie! I'd love to see your deck...! That was supposed to say I hope I get one to. Ah. Spell check and cold fingers don't work on tablets. Thanks so much, Carolyn! Simple, yet cute, I think! :) Are you participating in this swap as well? 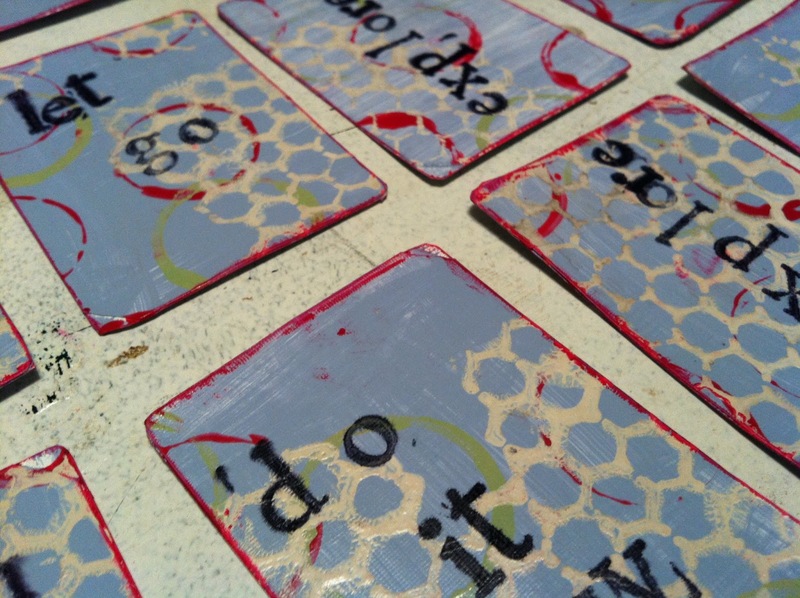 Shannon, I have experimented with art on a deck of cards. 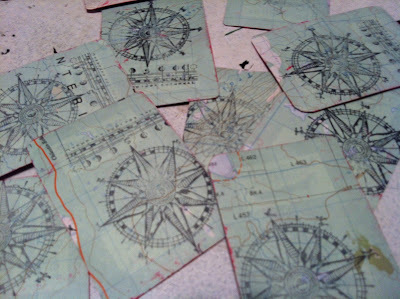 I am interested in how you kept the cards from curling after applying the paint and the map glued to the stamped side? When I painted I used acrylic paint and I had to include a few layers to cover the faces of the card. You'r cards are wonderful. I love the messages you used and would love to make my own deck. Hi Frogee! I did have some curling with my first coat of Gesso. I just bent them back with my hand. I found that once I had worked with them a little more, they began to flatten out. Also, I made this set as one large sheet (like in this post: http://musingsonrealities.blogspot.ca/2012/10/52-card-inspiration-deck.html), so by keeping them all together while I worked on them, they flattened out after a few different layers of media. Aside from the red around the edges of my cards, I did EVERYTHING while they were on the large sheet (the map, in this case). The last two steps were cutting them, then applying the red paint around the edges. Hope that helps! Thanks so much Shannon. I will need to make a trip to the local artsy store for a few supplies ;) I will experiment again. Thanks for sharing your process.